Disclosure: I received a free review copy of Fatal Frame: Maiden of Black Water from Nintendo. Opinions in this review are my own. Fatal Frame: Maiden of Black Water is the fifth main entry in the Fatal Frame series, but only the third fourth to make it outside of Japan. It doesn't matter if you've played the others though, since this is an independent story with the common theme of fighting ghosts with magic cameras (called Camera Obscura). So yeah, there are ghosts and it's a horror game, if you somehow weren't aware. The game takes place over a series of chapters which switch your control between three of the handful of main characters as they investigate cases of disappearing persons and objects on the cursed Mt. Hikami. This mountain, by the way, happens to have a reputation as a suicide hot spot and also has a dark history which you discover through reading lots and lots of conveniently placed notes, books, and notebooks. It's worth noting twice just how much of the backstory is told through these documents, although there are certainly voiced cutscenes as well (in both English and Japanese with an option for subtitles), but as this seems to be the main method of storytelling in most horror games these days, I doubt many fans will mind. Here, have a Camera Obscura. The fact that the game is divided into chapters is both a blessing and a curse. On the one hand, they offer good, clear places to save and quit after a long gaming session (though there is also auto-saving mid-chapter). Also, your stats for each chapter are kept track of, so it gives some motivation to revisit previous parts of the game to try for a higher score by photographing hidden ghosts, speedrunning it, playing on a higher difficulty, or just by being more efficient in battle in general. The chapters also help break up what might have been a monotony of exploring the same place for hours on end; in this case, characters typically go back home at the end of each chapter to regroup. On the other hand, the chapter breaks sometimes feel a bit forced and can break up the plot when you don't want them to. Part of the way through the game, I couldn't help but feel that my actions were a bit repetitive thanks to always going home between visits to Mt. Hikami, only to have another character lured away by ghosts five minutes later. Revisiting previous areas also contributed to this feeling of repetition a bit, but for the most part, previous areas are merely a means of getting to new areas (which are typically forests, old buildings, and shrines) and usually the chapters start you part of the way along the path so you don't have to backtrack the entire way. Dolls aren't as cute when they're hanging from trees at night. The plot itself is... alright. It certainly gets more complex than the basic premise that I mentioned, but it mostly just amounts to learning the history of Mt. Hikami while fighting off ghosts. Rarely does it feel like anything you do is actually working toward any kind of permanent goal; it's more just surviving and rescuing people and learning things. It's worth noting though, that there are multiple endings as well as an entirely separate bonus chapter. Basic reading ability is required to fully enjoy this game. As for the gameplay, it's a nice combination of exploration and combat. Your goal varies between chapters, but in most cases you'll be looking for a missing person or object. Sometimes you'll have a personal item which will allow you to trace a missing person and see a vision of which way they went, but in other cases you'll just have to explore. 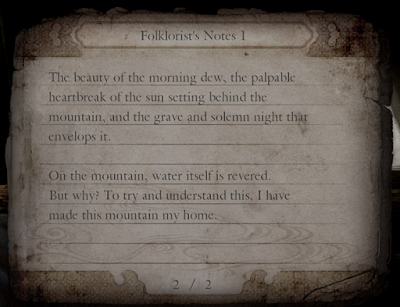 Along the way, there are scattered items which you can collect (healing stuff, extra film, backstory documents, etc.) and while your character slowly reaches out to pick them up, there's a chance of a ghost hand grabbing your arm. This can be dodged by releasing the "pick up item button" (ZR) as soon as you see the ghost hand, but in general it's more annoying than scary or fun. 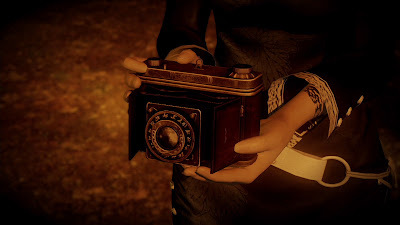 The camera obscura is also used in exploration by occasionally revealing hidden objects, giving hints on the location of a key for a particular keyhole, or by forcing you to go back and take a matching photo from one given to you. These additional uses for the camera are kind of neat, but it's always completely obvious when you need to use them, so they don't really add a whole lot either. In fact, in the few parts where you have to take matching photos, it kind of just feels like pointless filler. That said, it's a very minor complaint that rarely comes up, so don't let it dissuade you from giving the game a shot. Combat is pretty enjoyable, perhaps because I'm into photography in real life anyway, but it really is unique from any other game I've played (except, maybe, Pokemon Snap). Since you're using a camera, rather than shooting at one target as in a first person shooter, your goal is to tilt the gamepad to contain as many targets as possible within the frame. Your basic film is unlimited, but stronger film has to be found or purchased with the points you get while playing, so you'll want to be strategic with the shots you take. Even if you don't care about wasting all your good film, it takes time to reload the film between shots, so it's very important to wait for a good moment. 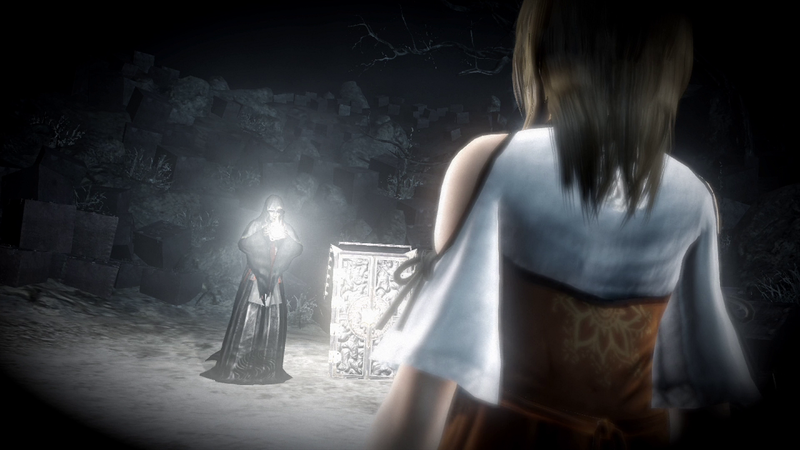 There are a variety of ghostly enemies which behave in different ways, but your main plan of attack will be trying to take a picture with at least five targets in the frame (as you fight, additional targets will float around the ghosts) and taking "fatal frame" pictures when the frame turns red just before you get attacked. Getting a "fatal frame" allows you to take multiple shots without the reloading cool down while having more targets in the frame knocks back the ghost and deals massive damage. The camera(s) can also be upgraded with spiffy lenses which are found throughout the game, granting special attacks that may slow ghosts down, heal you, do extra damage when your health is low, or other handy things. 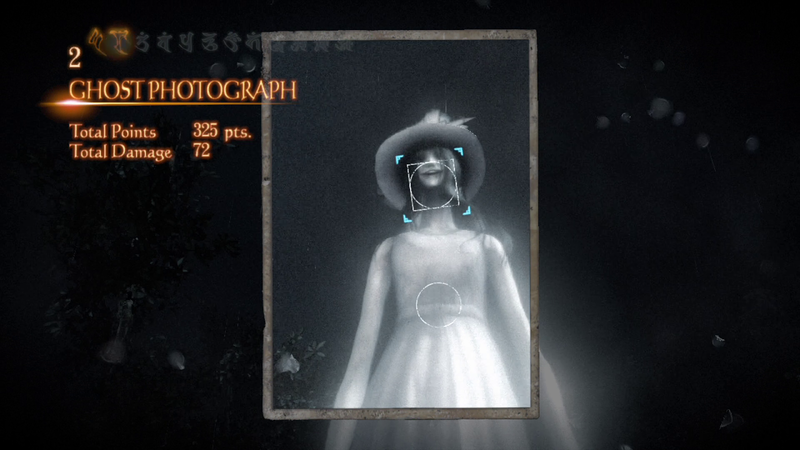 These lenses and the camera itself can be further upgraded by using the points you earn throughout the game from fighting and taking pictures of optional, non-hostile ghosts. As you may have heard in other reviews, character movement is a bit clunky and it's hard to turn quickly when in 3rd person view. This is a bit of an annoyance, but isn't too big of a deal since there is a dodge button when in combat which doesn't require you to wrestle with the controls at all. There's also an element to the gameplay relating to the titular black water - getting wet makes you more vulnerable to attack. There's also a more severe case of this which acts like poison and requires you to use an item to dry yourself off, but since you'll often be walking in the rain and getting knocked down by ghosts, you're probably going to settle for being wet most of the time. Speaking of being wet, the graphics are pretty good when it comes to water effects and wet clothing (fan service is definitely a thing in this game, there are even unlockable costumes to dress up the girls). 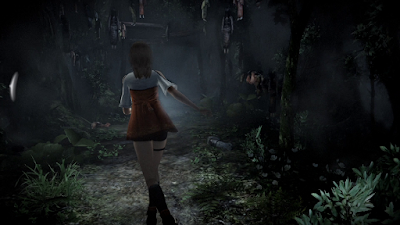 The characters and ghosts also look quite nice, but the graphics on the environments in general are hit and miss with a range of high and low quality textures. But my humble opinion is that the graphic quality is perfectly adequate. The audio is what you'd expect from a horror game - creepy sounds and moaning ghosts. The English voice acting is good enough, though the script is merely average, but there's always an option for Japanese audio if that's what you prefer. I did find that some of the dialogue was difficult to understand because of the audio balance, especially outside of major cutscenes, but as I mentioned before, there is an option for subtitles if you find that it's a problem. Fatal Frame: Maiden of Black Water isn't the scariest thing I've ever seen, but it's definitely creepy and fun to play for the most part. I wouldn't call it a must-play thanks to the merely average story and somewhat repetitive gameplay, but if it sounds like something you'd like, it's definitely worth playing. With all the incentives to replay previous levels for higher scores, faster times, missed items and ghosts, and harder difficulties, there's quite a lot of content here to get fans to stick around and get their money's worth. It's a good game, but whether or not you'll enjoy it comes down to your personal tastes, as always. I recommend giving the lengthy demo a try, while keeping in mind that the story and combat does get more complex further in the game.